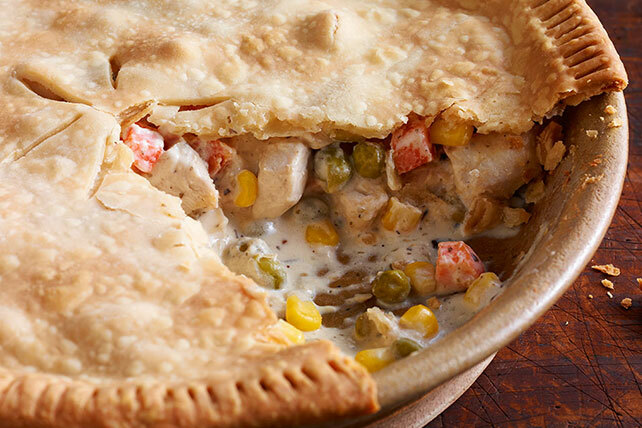 Avoid the freezer case and prepare your own Homemade Chicken Pie. Homemade Chicken pie is light years tastier and can be made in less than an hour. Cook cream cheese and broth in large saucepan on low heat until cream cheese is completely melted, stirring frequently with whisk. Stir in chicken, vegetables and dressing mix. Spoon into 9-inch pie plate. Cover with pie crust; seal and flute edge. Cut several slits in crust to allow steam to escape. Place pie plate on baking sheet. Bake 20 to 25 min. or until golden brown. Serve with a mixed green salad and glass of fat-free milk. Prepare as directed except for baking. Wrap securely; freeze. When ready to bake, unwrap. Place strips of foil around edge to prevent over browning. Bake frozen pie in 425°F oven 1 hour 10 min. or until heated through. Prepare using GOOD SEASONS Zesty Italian Dressing. Substitute turkey for the chicken. Prepare using PHILADELPHIA Neufchatel Cheese, or GOOD SEASONS Zesty Italian Dressing, or substituting turkey for the chicken.